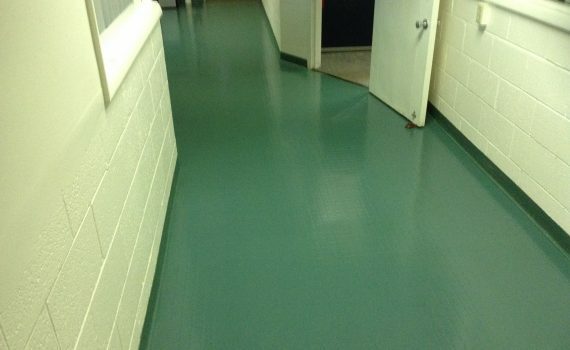 Vinyl Composite Tile (VCT) is a common choice of flooring in commercial buildings, most commonly found in restrooms, kitchens, exam rooms and hallways. It either comes in 12” squares or in a sheet. When properly cared for, it looks positively amazing and can last a lifetime. However, if you want to eliminate the biggest problem with VCT refinishing, eliminate stripping! Every year customers spend a fortune on the products and labor to strip and recoat their floors. Not only is it expensive, but it’s dangerous. Common floor stripping chemicals can be highly toxic and when applied to a floor they create an unbelievably slippery surface. The good news is that by starting fresh and introducing new technologies, you can extend the life of your floors dramatically. Cross-linking polymer acrylic wax was introduced to the Vinyl world in the 1960’s. It was far superior to the traditional way of applying paste wax to the floor and polishing it. Over time, it improved slightly but the technology is pretty much the same as it was in the 60’s and 70’s. In the last 5-10 years technology in cross-linking co-polymer urethanes have exceeded customer expectations in durability, anti-slip, and anti-microbial concerns. 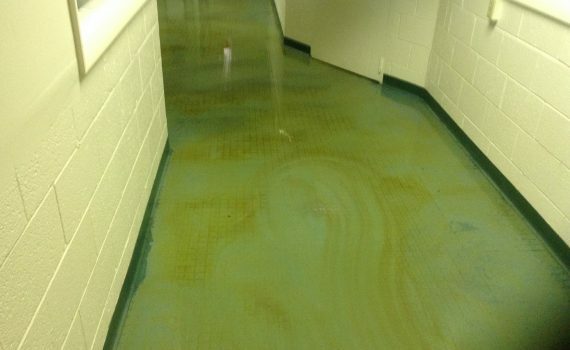 Today’s modern coatings use nano technology to penetrate deep into the pores of the VCT to mechanically bond with the surface providing a very durable, slip-resistant coating that will not fade, yellow, or chip off. Plus because many of them have anti-microbial properties built in, clean up no longer requires alkaline chemicals to kill germs and bacteria. Oftentimes a microfiber mop and hot water are all that is needed. These coatings will last for up to 5 years without buffing, burnishing, or additional labor. When it comes time to re-apply, we abrade the surface slightly and apply another coat. Sweep or vacuum floor of any loose debris. Apply stripper to the floor one last time to remove any acrylic floor finish left behind. Thoroughly rinse floor and bring it to pH neutral. Allow floor to dry completely. Apply from 1-4 coats of urethane coating. This will be dependent on coating used, and porosity of the tile. Allow coating to completely dry for up to 12 hours.